Beck: Mongolian Chop Squad. Talk about a mouthful. The name may be a tribute to the author’s favorite band, Red Hot Chili Peppers, which also has four words in its name. In any case don’t be scared away by the name, this series about a rising rock band is a treat even for non-music fans. The focus of the show is Yukio “Koyuki” Tanaka. At the beginning of the series, Koyuki lacks direction. After he meets guitarist Ryûsuke Minami and sees his band play, Koyuki is hooked. 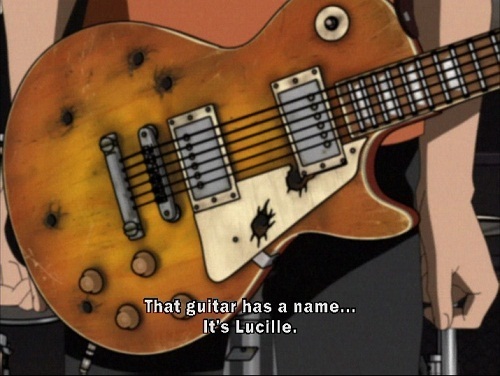 Koyuki starts learning guitar, and by episode 8 he joins Ryûsuke’s new band, Beck. 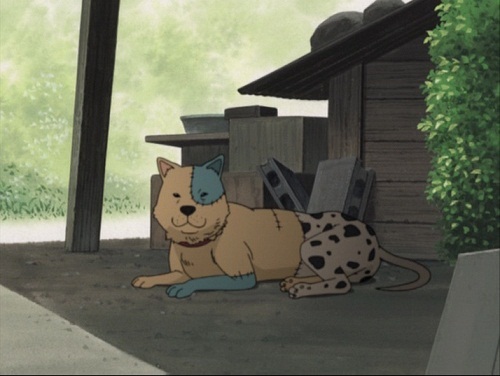 Mind you, this Beck has nothing to do with singer Beck Hansen (of “I’m a loser” fame), the band is named after Ryûsuke’s strange, patchwork dog. Koyuki’s passion for music is my favorite part of the series. He throws himself into learning the guitar and into becoming part of Beck. His love of music is infectious. Whenever I watched the show, I wanted to drag out my guitar and play as well. Koyuki is by no means perfect, like many school age anime characters he is plagued by low self-confidence. Still, Koyuki starts the series as a middle schooler and it is easy to empathize with Koyuki’s difficulties. Who wouldn’t want to fast forward through most of middle school? While I can excuse Koyuki’s predictactable issues, I cannot forgive the show’s uneven music. A show about a band should have great music. Sometimes Beck rises to the challenge, like when they do a Beatle’s cover. Still, a lot of the music was forgettable. I liked select tracks enough to buy the show’s soundtrack, but I suspect I am one of only a few who did so. I loves me some Beck. The music was pretty weak but it isn’t a surprise when at times the budget for the animation itself doesn’t seem to be there. But the show still shines even with this drawbacks. I’m glad I’m not the only one that liked the show. I was really disappointed that it didn’t have a second season. Edit: Maybe the live action movie will have a bigger budget and better music. After finishing up K-ON! !, this could serve as a good contrast/follow-up to band-oriented anime. Will definitely check it out. I’ve only watched the first 15 or so episodes of K-On, but as a band oriented anime I liked Beck better. As I noted below most of Beck is available on Hulu. I got about halfway through this then, for a number of reasons, I didn’t get around to buying the last couple of DVDs. Which is a shame, because this show is Relevant To My Interests on several levels. Since I’ve only seen the first half perhaps I’m underwhelmed with the music because, at that point in the story, the band are still inexperienced and trying to nail ‘their’ signature sound. The relaxed pacing and everyday themes didn’t put me off though – it’s the most realistic portrayal of the pains of adolescence coupled with an average teenager’s discovery of contemporary music. The only other story that matches is probably Inio Asano’s stunning manga Solanin (which I heartily recommend). I can remember being the same sort of bored sixteen-year old being inspired to pick up the guitar…the end theme reminds me a lot of early Oasis, who were one of my big influences back then. So yeah…I’ll have to find a way to buy the rest of this show…it would be almost embarrassing to admit that K-On! was the only thing that tempted to pick up my dusty axe again! I’d definitely recommend finishing it, the last two discs are my favorite. If you are in the US Funimation may still be streaming the show for free on their site. Otherwise Funimation also has the complete set for ~$30. I know we have discussed this before, but the music in Beck not speaking to me is the biggest reason why I never really got into this show, even though I did watch it all. Though I’m surprised you didn’t mention the upcoming live-action film! I’m hoping the the change of medium will do all the things for Beck that it couldn’t do for me as an anime. I’m excited about the movie but I am discouraged that I will have to wait so long to see it. I figure a year and a half at least until it hits DVD here. Are you interested in watching it? The way that I reasoned away the sometimes mediocre soundtrack of Beck was that I assumed the band was better than average, but not incredible. This apparently conflicts with the manga, though, where the band is the best thing since sliced bread. An exception, though: the scene in the English dub where Koyuki and Maho sing Full Moon Sway in the pool together. One of those moments of anime that gives chills! Another thing I really liked about Beck was that Koyuki doesn’t become part of the band overnight–he has to work for it, hard. It takes more than learning how to play guitar to pull himself out of the rut, too! Full Moon Sway was one of my favorite songs as well. I wonder whether I would have liked some of the other songs if I was Japanese. I have read the whole manga (all the books I could get in germany and the rest in scanlation, because the publisher stopped the series over here) and saw the anime series 2 times. I bought the 2 soundtrack cds and I love the music. I even had one song as my ringtone for some time!! I’m glad you liked it as much as I did! I’m interested to hear what you thought of the second soundtrack, the one with original songs that were not used on the show. I still have both, but tend to only listen to the show’s songs.